The creations that come out of Whitney's brain. So E has challenged me to make myself a blackworked coat, similar to the beautiful blackwork in Anonymous (beautiful blackwork, horrible storyline). I will be doing the pattern that is slightly longer then the knee, but not so long as to be floor length. I think this will allow me to wear the coat even when I don’t have a bustle on. It is 3.5″ wide and 4.5″ long repeating pattern. 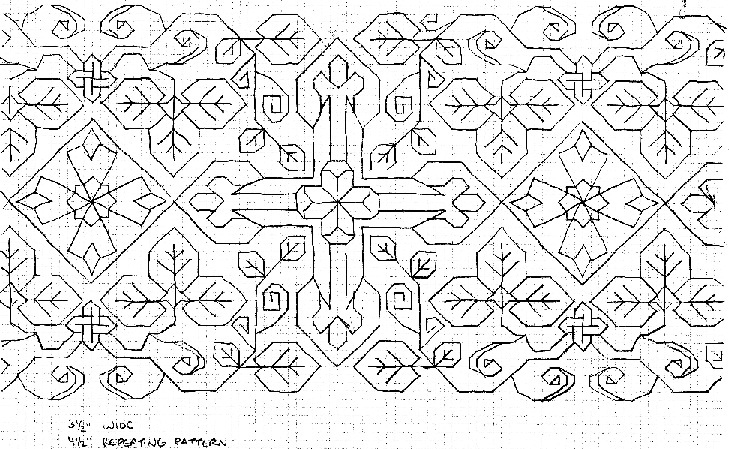 I will be doing the pattern in long lines down the coat, with probably 2.5″ between the longitudinal striped blackwork. This pattern is approx 1/2″ wide and will run the length of the inside and up the turn of the coat.